member of the Academy of Sciences of the Ukrainian SSR, Doctor of Technical Sciences, Professor, Honored Scientist of the Ukrainian SSR, Laureate of the Lenin and State Prizes, Hero of Socialist Labor, General Designer Vladimir Alekareevich Lotarev. Vladimir Alekseevich Lotarev, a well-known Soviet scientist, General Designer, creator of aviation gas turbine engines of a large resource and high degree of reliability, was born on November 15, 1914 in the town of Shakhty, Rostov Region into a working-class family. Father - Alexey Evgrafovich worked as a miner, mother - Valentina Prokofievna devoted all her life to family and household. V. Lotarev began his career in 1930 as an apprentice to an electrician at a mining school in the city of Shakhty. After graduating from the Kharkov Aviation Institute, V.A.Lotarev from 1939 worked at the Zaporozhye plant named after Baranov No. 29 (now Motor Sich JSC) as a design engineer, head of the design group for fine tuning of the M-89 experienced engines installed on the Il-4 bomber He participated in the creation of the M-90 engine for Sukhoi aircraft. After the evacuation of the plant number 29 in Omsk from September 1941, he took part in setting up the serial production of the M-88B engine for the IL-4, and then from 1943 the new ASH-82FN piston engine for the Tu-2, Pe-2 bombers La-5, La-7 fighters and Il-12, Il-14 transport aircraft simultaneously led the development of new designs. From September 1944, he worked in the serial-design department of the plant as the lead designer for the M-26 engine and deputy chief of the serial-design bureau. In this position he was responsible for improving the reliability of M-88B, ASH-82FN serial engines. With the direct participation of the leading designer Lotarev V.A. It was designed, manufactured and commissioned for state tests of the motor of average power M-26. On August 30, 1945, he was transferred to Zaporozhye in the OKB of Plant No. 478 to the position of lead designer for the further development of the M-26 engine and its modifications. In March 1946, he was appointed Deputy Chief Designer of the Design Bureau, in 1963, Chief Designer of the State All-Union Design Bureau, and in 1981, the General Designer of the Zaporizhia Machine-Building Design Bureau Progress. 1. A family of piston aircraft engines AI-10, AI-12, AI-14R for training, combat and light multi-purpose transport aircraft Yak-12, Yak-18, Yak-20, An-14. 2. The family of piston and gas turbine engines: AI-4V, AI-26V, AI-14V, AI-7, AI-24V, TV-2VK, which were installed on helicopters B-5, B-9, B-10, B- 11, Ka-10, Ka-15, Ka-18, Ka-26, Mi-1, Mi-7, Mi-8, Yak-100 and Ka-22 multi-purpose transport rotary-wing. 3. The family of launch aircraft engines: TS-12F, AI-2MK, AI-8, AI-9, AI-9V, which are used on the An-8, An-10, An-22, Be-12, Il-18 , Tu-95, Tu-114, Yak-40 and on the majority of Mil and Kamov helicopters. 4. The family of powerful turboprop gas turbine aircraft engines of a large resource: AI-20K, AI-20D, AI-20M, AI-24 for passenger An-10, An-24, Il-18, military transport An-8, An-12 , An-26, special purpose aircraft An-30, Il-20, Il-22, Il-38 and the Be-12 seaplane. AI-25 - up to 12,000 hours. 5. The first in the USSR engine AI-25, which was installed on the passenger Yak-40 and agricultural aircraft M-15. 6. A family of turbojet bypass engines for training aircraft: AI-25TL and DV-2 for Czech aircraft L-39, L-59. 7. The family of engines with a high degree of bypass: DD-36 TRD for passenger and transport aircraft Yak-42, An-72, An-74; TRDD D-18T for the most heavy-lifting aircraft in the world An-124 "Ruslan" and An-225 "Mriya"; D-136 turboshaft engine for the world's largest and largest helicopter Mi-26. A distinctive feature of aircraft engines created under the leadership of V.A. Lothareva is a deep study of gas-dynamic, constructive, industrial and technological solutions and their optimization in combination with high reliability, long service life, simplicity and cost-effectiveness in operation, which ensures their mass, long-term and successful operation on a large number of civil and military aircraft. In the development work, it was possible to solve a whole complex of complex technical problems by means of an organic combination of scientific calculation methods, progressive design and extensive experimental studies. For great research work on the creation of aircraft engines Vladimir Alekseevich Lotarev in 1971 was awarded the degree of Doctor of Technical Sciences, and in April 1976 he was elected a corresponding member of the Academy of Sciences of the Ukrainian SSR, in 1982 by the Decision of the Higher Attestation Commission under the Council of Ministers The USSR was awarded the academic title of professor in the design and strength of aircraft engines, and in 1985 A.V. Lotarev was elected a full member of the Ukrainian SSR Academy of Sciences. Vladimir Alekseevich had 130 copyright certificates for inventions in the field of aviation technology and printed works on the same subject. Vladimir Alexeyevich Lotarev combined the great scientific and design work with the fruitful work of preparing highly qualified engineering and scientific personnel. Under his leadership, the company brought up a large group of researchers and experimenters who successfully solved the complex issues of the theory and practice of engine building. 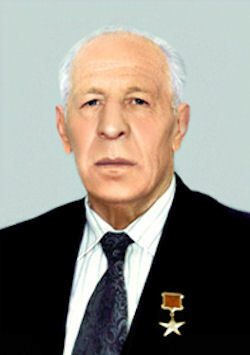 Honored Scientist of Ukraine (1984). Vladimir Alekseevich Lotarev's great scientific design and organizational activity, his high responsibility for the work entrusted to him and his significant contribution to the national economy and the country's defense capability earned him the deserved authority of a large aviation specialist. He died on July 20, 1994.